Women do the office-housework - how can we change it? WDV are partnering with City of Maribyrnong to deliver the Enabling Women Leadership Program in Footscray in October and November. The leadership program will be open to women with a disability from Melbourne’s Western region (Maribyrnong, Hobsons Bay, Wyndham, Brimbank and Moonee Valley local government areas). The Other Film Festival is on now - finishing tomorrow. Director (and proud Deaf woman), Mija Gwyn, talks in this video about why she chose FEMINISM as a theme for this year's festival. See the Festival Program. It's that season again - community organisations are inviting you to attend their annual general meetings. There's some good ones coming up. You might like to see this list and think about going to one or two. Women's Health Golbourn North East invite you to the launch of their Respect and Equity Campaign at their AGM: September 26, 5 - 7pm at Quality Hotel Gateway, Wangaratta. Independent Member for Indi Cathy McGowan, will speak about the importance of respect in politics and in the community, and how respect and equity go hand in hand. See details and RSVP. 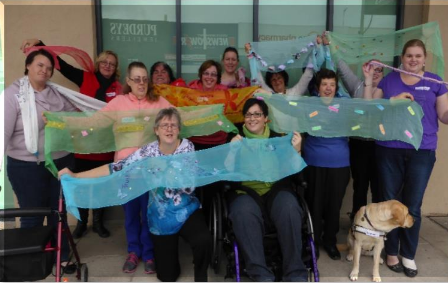 Gippsland Disability Advocacy's 30th Annual General Meeting with guest Speaker, Sue Smith Self Advocacy Resource Unit. Monday 24th October 2016, 6pm for 6.30pm opening Light refreshments will be served. Location: Gippsland Disability Advocacy Suite 2, first floor 6 – 8 Grey Street Traralgon. RSVP’s for catering purposes by Monday 17th October 2016 to administration@gdai.org.au or by telephoning 51 75 0444. The WIRE (Women's Information and Referral Exchange) AGM begins at 5:45pm on Thursday 20 October. It is followed by dinner & drinks at 7:30. There will be a delicious meal at the Angliss Restaurant, 550 Little Lonsdale St, Melbourne. Join WIRE volunteers, staff and board and bring your family & friends for dinner too! $30 per adult guest & $15 per child guest. All drinks complimentary from 7:30pm. RSVP to WIRE by Monday 17 Oct 2016 (phone 9348 9416). Please specify any special dietary requirements when booking. WDV is looking for an experienced Gender Equity Program Manager to oversee the third phase of WDV's Gender and Disability Workforce Development Program. The position is for 6 months (may be extended subject to funding). The closing date for applications is Monday 3rd October at 9am. Women with disabilities are encouraged to apply. This position was held by Fofi Christou who will be moving into a new Senior Program Manager role at WDV. For details see Ethical jobs (posted Spt 15th) WDV's employment page. The Victorian Government is advertising for a Senior Projects Officer in the Office for Disability. Applications close at Midnight. WDV's board member, Sonja, is inviting expressions of interest from community members with disabilities be consulted on designing a new hospital. The consultation will be about interior design, Disability Discrimination Act requirements and features for the new Joan Kirner Womens & Children's Hospital in Sunshine. If you are interested in attending the consultation phone 9397 3028 or email Sonja for details. It will be exciting to learn more about the new Hospital getting built. The Victorian Government is funding the construction of 15 new Changing Places facilities. This funding forms part of $3.3 million in funding announced through the Victorian Budget 2016-17 to kick-start initiatives under the Victorian state disability plan 2017-2020 which is due to be in place on 1 January 2017. Changing Places are larger than standard accessible toilets with extra features and additional space to meet the needs of people with a disability and their carers. Providing accessible public toilets with better facilities enables people with disabilities to participate more fully in social, recreational and community activities. A survey is being conducted to seek feedback from people with disabilities, their family, carers and the community about where Changing Places facilities are needed most. This survey will be conducted by the Association for Children with a Disability on behalf of the Victorian Government. The survey closes Monday 10 October 2016 @5pm. The Australian Government is running a survey for carers on how information, services and support are delivered to them. WDV would like to share this survey here because we know that so many women with disabilities are carers. The survey should take no more than 15 minutes to complete. Any questions relating to the survey, please email Ariel Spigelman. Breast Cancer Network Australia wants to better understand the experiences of people with a disability affected by breast cancer, their families and supporters. If you are interested in sharing your story or would like to find out more visit https://www.bcna.org.au/news/. Alternatively please contact Grace Daley by email at gdaley@bcna.org.au or call 1800 500 258. "When 34-year-old Camilla Nielsen chose to become a parent, she risked her life... As well as carrying the risk of passing the genetic disease on to children, women with Muscular Dystrophy who become pregnant risk worsening the symptoms of their syndrome as a result of increased muscle weakness... But despite all this, Camilla says that she loves the life she has made, and knows that she made the right decision in having children." 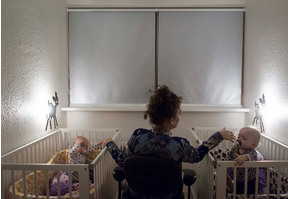 While having children might not be what is going to work for all of us, Camilla reminds us that it is something that women with disabilities can be rockstars at parenting. This series of photos captures moments of Camilla with her children. Victoria Police has released an Easy English version of their Accessibility Action Plan 2014 – 2017. The Plan aims to improve the outcomes of people with disabilities when they come into contact with Victoria Police – whether as victims of crime, witnesses, suspects, people in custody, employees and prospective employees, community partners, or simply those in need of assistance. Other Police Easy English resources include ‘Reporting Crime: Your Rights’ and ‘Reporting sexual assault’. Digital safety, family violence and risk assessment. These will run through October and November. See DVRCV's training calendar for details. Steve Dow wrote for the Guardian about WDV member and 'Neighbours cast member, Kate Hood. "At the Arts Activated conference this week, the actor Kate Hood told the audience that while about 18% of Australians have a disability, probably only about 4% of characters on stage and screen are portrayed with a disability. She called for the Media, Entertainment and Arts Alliance’s actors equity division to institute a quota on artists with disabilities; just as it was unacceptable to “black up” racially for a role, she said, able-bodied actors should no longer be able to “crip up” as disabled." Read the full article in the Guardian. "Late one Friday afternoon at a leading consulting firm, a last-minute request came in from a client. A female manager was the first to volunteer her time. She had already spent the entire day meeting with junior colleagues who were seeking career advice, even though they weren’t on her team. Earlier in the week, she had trained several new hires, helped a colleague improve a presentation and agreed to plan the office holiday party. When it came time for her review for partner, her clear track record as a team player combined with her excellent performance should have made her a shoo-in. Instead, her promotion was delayed for six months, and then a year. This is the sad reality in workplaces around the world: Women help more but benefit less from it. In keeping with deeply held gender stereotypes, we expect men to be ambitious and results-oriented, and women to be nurturing and communal." This article by Sheryl Sandberg and Adam Grant talks about the problem and how to begin to change the situation.